Germany took regarded Japan’s attempt to take Emperor Gojong to Nagasaki during the 1904-1905 Russo-Japanese war negatively, a note written by Kaiser Wilhem II deciphered yesterday shows. 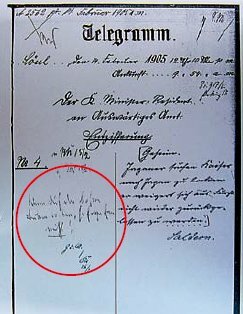 Kaiser Wilhelm II’s handwritten message on the left side of the secret telegram sent by Saldern, German envoy in Seoul, to the foreign ministry in Germany on Feb. 14, 1905, expresses doubt about the plan, Jung Sang-su, research professor and lecturer at Myongji University, told The Korea Herald. “It says ‘There will be no results.’ Considering Wilhelm II’s usual cynical way of saying things, it is likely that he meant that the transfer of Gojong would not easily be accomplished. We can see that he had a negative stance toward Japan’s plan,” said Jung. Several diplomatic documents, including the telegram dated Feb. 14, 1905, obtained by The Korea Herald show that Japan attempted to take Emperor Gojong to Nagasaki during the 1904-1905 Russo-Japanese War. According to the documents, Gojong resisted the plan and Russian Czar Nicholas II opposed it, but the British are said to have agreed to the removal the emperor as well as the annexation plan. Then-U.S. President Theodore Roosevelt postponed his decision on the establishment of protectorate over Korea but criticized the plan to remove Emperor Gojong. The documents also show how the Japanese viewed Emperor Gojong as a major obstacle to annexing Korea. “I do not know the details about Japan’s attempt to take Emperor Gojong to Nagasaki. But it is not a surprise that Japan planned such a thing,” said Yi Seok, nephew of King Sun-jong, the last monarch, after hearing the news. “I have heard many stories about Emperor Gojong’s sufferings. He was slapped in the face by the five Eulsa traitors for refusing to sign the Eulsa Treaty (1905 Protectorate Treaty),” Yi said, adding that Gojong also appealed to Nicholas II saying that he wanted to die in Russia. “I haven’t seen documents regarding this issue in Japanese diplomatic documents, but it can be recognized as a fact as the plot was discussed in German diplomatic dispatches. There is possibility that the Japanese military authorities came up with the plan as the follow-up step to their victory in the Russo-Japanese war, to completely deprive Korea of its diplomatic powers,” said Lee Tae-jin, honorary history professor at Seoul National University. “Civilian politicians like Ito Hirobumi asserted on establishing a protectorate over Korea by simply taking away Korea’s diplomatic powers, but some hard-liners, like the military authorities, insisted on immediate annexation of Korea in 1905, as soon as the Russo-Japanese war ended. It is likely that the hard-liners came up with the plot to take Gojong to Nagasaki but it was blocked when Ito Hirobumi opposed the immediate annexation of Korea,” said Lee.